The view in Little Figures is of the crowded sidewalk in front of Thorley’s florist on the northwest corner of Fifth Avenue and Forty-Sixth Street in Manhattan. Milne inscribed the front of the painting with the date April 7, 1912, which was Easter Sunday that year. This may account for the change in title—the work was exhibited as Little Figures at the Armory Show, then as Easter Sunday in a 1984 exhibition of Milne’s watercolors at the Herbert F. Johnson Museum of Art at Cornell University in Ithaca, New York. Milne sent five works to the Armory Show, three watercolors and two oils, all from 1912. Although he was not among the artists who were invited to participate in the exhibition, his works were accepted after he submitted them for examination by the Domestic Committee. He offered Little Figures for sale for $70, but it was not sold. See cat. no. 104.10, Fifth Avenue, Easter Sunday, in David Milne, Jr., and David P. Silcox, David B. Milne: Catalogue Raisonné of the Paintings, Vol. 1: 1882-1928 (Toronto: University of Toronto Press, 1998), 70. The other watercolors were The Garden (private collection) and Reclining Figure (unknown location). The oils were Distorted Tree (National Gallery of Canada, Ottawa) and Columbus Circle (unknown location). “American Pictures at the International Exhibition Show Influence of Modern Foreign Schools,” New York Times, March 2, 1913, SM 15. “Art Productions of Many Sorts Shown in International Exhibition,” Christian Science Monitor, February 21, 1913, 15. In choosing to paint traditional subjects in an untraditional way, Milne planted himself firmly in the center of artistic movements of his time. He aligned himself neither with the established artists such as William Merritt Chase and Childe Hassam, who painted similar genteel views of New York in impressionistic styles, nor with the young radicals of his generation such as John Marin and Charles Demuth, who were using watercolors to create truly modernist images of the city’s changing landscape. Though Milne exhibited frequently, including in the annual exhibitions of the American Water Color Society, the New York Water Color Club, and the Philadelphia Water Color Club, he never achieved significant commercial or critical success. Instead, he remained on the periphery of the New York artistic circles until he left the city to settle in the small upstate village of Boston Corners, New York, in 1916. There his works became increasingly experimental, featuring silhouetted graphic shapes and a dark palette of black, gray, and green. 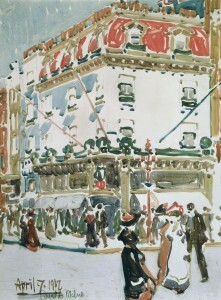 Carol Troyen, “‘A Welcome and Refreshing Note’: Milne and the New York Art Scene, 1903-1913,” in Katharine Lochnan, David Milne Watercolors: “Painting toward the Light” (Vancouver: Art Gallery of Ontario, 2005), 17.